The first thing to note is the cover - which I love, especially put against the US version! The new art direction on Sanderson's covers is gloriously minimalistic compared to a lot of fantasy, and it's nicely... stark. Well, that's personal taste for you. Onto the book itself. And it stands up surprisingly well! You can immediately spot the hallmarks of Sanderson's later novels: the magic system, AonDor, first among them. Today, Sanderson is known for his magic systems (and his advice regarding them - just google 'Sanderson's First Law' and you'll see! ), and AonDor likewise is key to the novel's plot. Although not used regularly in the same way as Allomancy or Awakening, it's nevertheless significant, and working out how it went wrong is a fun exercise in the same way that Allomancy's mysteries are. It's scientific magic - and it shows. So, what about characters? Well, we can spot what could even be a proto-Kelsier: a 'leader of the downtrodden'-type figure. Raoden, who attempts to resurrect society within the fallen city of Elantris, though less obviously flawed than Kelsier, nevertheless gives some of the same overtones: he's charismatic, intelligent, and inspires loyalty. And again, there's one of Sanderson's strong female protagonists - Sarene, who intervenes in the failing politics of Arelon. 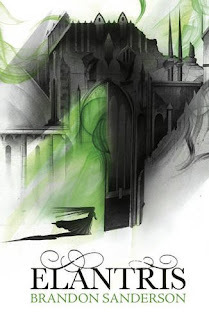 Nevertheless, there are some areas where |Elantris doesn't stand up as well: it is a first novel, after all. It's easy to see that Brandon Sanderson has grown immensely in writing and building character since Elantris. Though in some cases acceptable, the character reactions in Elantris are frequently over-optimistic epiphanies at best, and I much preferred it in Mistborn, where we got a more realistic level of cynicism... Though maybe I'm just too used to being gloomy. :P Blame the weather! The author has suggested a possible Elantris sequel - and since I'm enjoying my reread so much, I'm finding myself looking forward to it! All in all, Elantris was a fun debut that promised even better things to come: and now Sanderson's delivered, why not give his earliest novel a go? So, now it's your turn - have you read this book, or been pleasantly surprised by a reread? Comment below and tell me! I love this cover style!! I must admit, I am not a big fan of the old-fashioned illustrated covers a lot of fantasy novels have. It's shallow, but I just don't find them particularly attractive (beautiful art, but I just don't really like them as book covers). It's why I really want to buy the Mistborn trilogy with these covers (http://www.amazon.ca/Brandon-Sanderson-Mistborn-Trilogy-Ascension/dp/1780484917/ref=sr_1_4?ie=UTF8&qid=1316115584&sr=8-4) but unfortunately they seem to be sold out/out of print. I've only read one book by Brandon Sanderson and that is The Way of Kings, which is fairly recent so I think it should be interesting for me to go backwards in his books and read his earlier stuff compared to my first impressions of his newer stuff. Definitely going to read Elantris ... one day, haha. One of the things I loved about The Way of Kings is the magic though (I can't remember if it had a name, but their little light things that they use as money), so I look forward to reading more of his books with strong magic systems! As for your question, I don't really re-read books that often. I used to when I was little, because my parents were the source of my books so I was stuck with the ones I have, but now that I can afford my own books, I find I have so many books to read, I don't have "time" to go back and re-read ones I've already read :( I DO want to re-read the Song of Ice and Fire series one day though. After I read up many fans' theories on plot developments, with all the clues they use to support them, I want to re-read the books to find the clues myself! Yes, I totally agree - though it has worked well before (some of Kay's covers are fantastic). The Mistborn covers are wonderful - and it's really weird that they're out of stock in Canada, because we've got heaps in the UK, as I remember. The Way of Kings was pretty good, I thought: really interesting worldbuilding (much more interesting to read about than Robert Jordan - the fauna was incredibly imaginative). Bit too much of 'introduction to 10 book series!' though - it lacked resolution in a lot of places as you can probably expect. :P What did you think? The magic system was great - but then again, Sanderson's always are. Mistborn is particularly good to start with, because the system's almost fully explored in the trilogy, so you actually get the answers (whereas in The Way of Kings, you have... a lot more questions). Oh, really? I reread books a lot, actually - well, not all the time, but definitely from time to time I like to give my favourites another go. I can't imagine - not - rereading Erikson, for one - it's just so complex! Like ASoIaF, you pick up so much on a reread that you can't first time through. Have you read Kate Griffin, by the way? Why, thank you! I haven't read Salvatore, but yes, I'd definitely recommend Sanderson (if you can't tell by the post :P ) - if you're interested, there's a 'Brandon Sanderson' tag at the bottom of the post that you can click for the rest of my reviews of his. Mistborn would definitely be my recommendation with Sanderson (waiting for long series to finish can be a pain... especially with 10 books).